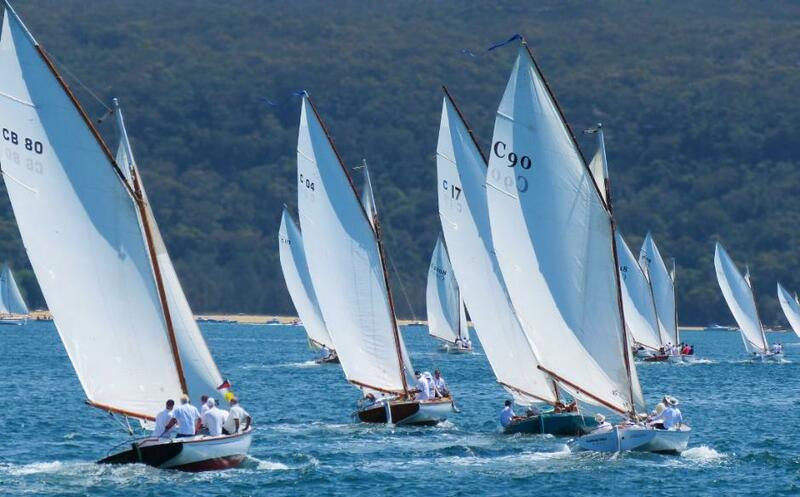 Sydney’s first-ever Couta Week ended on Sunday October 25th and though the lightweight wolves in sheep’s clothing from Victoria set the pace in the gusty sea breeze, it was the local fleet that dominated the 5th annual Wattle Cup on handicap. 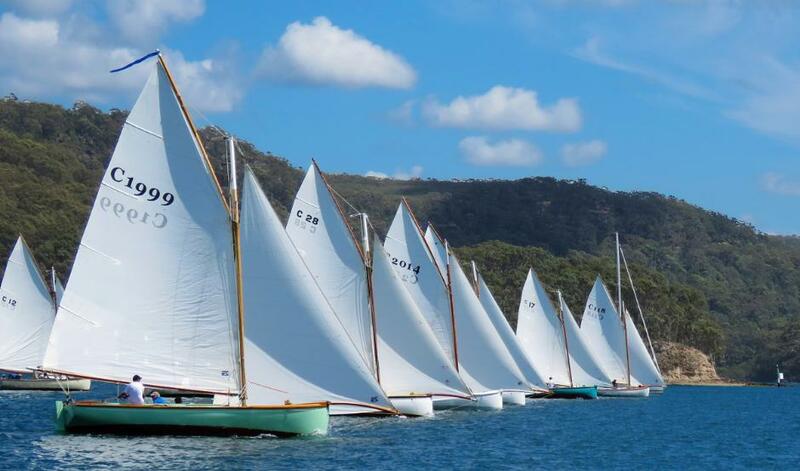 Pittwater resembled an early 20th Century period film set over the weekend when 15 heritage boats set off on their final passage race around Lion and Scotland islands. The weekend prior it was Sydney Harbour’s turn, when nearly 100 gaff-rigged boats from various eras, including the Australian Prime Minister Malcolm Turnbull’s Couta, Rob Roy, took charge of the busy port for Gaffer’s Day. Couta Week drew five Sorrento and Flinders Island based crews north to join the growing NSW fleet and to race with the Royal Prince Edward Yacht Club, Sydney Amateurs Sailing Club and finally the Royal Prince Alfred Yacht Club over two weekends, plus mid-week twilight sailing and socialising. Compared to benign flatwater sailing on Port Phillip, Sunday’s cracked off dash from Barrenjoey headland to Lion Island was for the Victorians a new experience and a sight to behold for anyone else out boating. The run out Hawkesbury River tide and opposing gusty NNE winds up to 20 knots created a steep chop that pushed the Coutas to full stretch and had them surfing down waves, saltwater rushing over the gunwales. On handicap the four race Wattle Cup went to Don Telford’s Tenacity from Clive Knott’s Emily and Russell Barrett’s Wattle, the 1928 built and restored Victorian namesake for the Pittwater Couta series. On scratch, or first over the line results, the lightest built Victorian wolves’ reigned supreme. Boat builder Mal Hart’s Jocelyn narrowly beat Colin Mitchell’s Rhapsody and Jeff Richardson’s Georgia, fresh out of The Wooden Boatshop last week and on to the dais. “Jocelyn and Georgia are referred to as ‘regatta boats’,” the NSW president advises, “built specifically to win regattas. They are lightweight in construction and the rest struggle to keep up.” Jocelyn also cleaned up the Couta division on handicap at Gaffer’s Day on Saturday October 17, 2015. Historically the Mornington Peninsula fisherman named their boats after wives or other significant females and the tradition has flowed on to the modern Couta fleet. The Wattle Cup was presented to Telford and his crew at Sunday evening’s finale gala dinner at the RPAYC. A new trophy, found days ago in the club’s archives where it had sat for half a century bearing the name of the now obsolete 21-foot class, ironically a descendent of the Couta Boats, went to Barrett’s Wattle for first boat on corrected time among the heritage fleet (built pre-1983). “I’m very proud to own Wattle which Tim Phillips rescued from Adelaide in the 1980s where she was a houseboat. She still can be the fastest, depending on the skipper’s mood,” Barrett promises. Over at the RPAYC at Newport yesterday morning the Victorians were busy unrigging and loading their beloved Coutas onto a B-Double truck for the long haul back to Melbourne to club racing out of the fleet’s historical HQ, the Sorrento Sailing Couta Boat Club. For the quietly spoken Phillips, the man who resurrected the Couta design and restores and builds them for modern day racing plus campaigns his own 1917 built Muriel, the class’ camaraderie and level of interest the boats en masse generated in Sydney over the past week are his lasting impressions. Tim Phillips’ 30-year Couta journey is a long way from finished. It’s his vision to take the Australian Coutas infinitely beyond their humble beginning as late 19th and early 20th Century fishing boats to Italy’s Lake Garda for an international regatta. A Couta boat is a gaffed rig sailing boat originating and sailed in Victoria around Sorrento - Queenscliff and Victoria’s west coast. The Couta boat was developed for fishing between 1870 until the 1930s, diminishing until the 1950s. Inspired by the English fishing smacks but redesigned to be smaller without a cutter rig for more speed, agility and a retractable centreboard. Most Coutas are 26ft (7.8m) and usually built with Huon pine or imported teak, taking 1500 hours to build. They carry 600 square feet of sail and weigh in at over 5 tons. Performance wise they are as fast as most 26-30 foot modern yachts even though they were designed over 100 years ago.